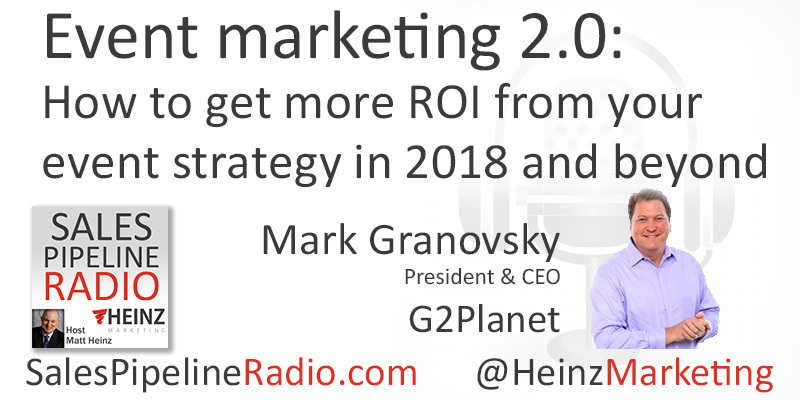 Our guest is Mark Granovsky, President and CEO of G2Planet which does Event Marketing and applies data science to a growing field. When people think of event marketing, they don't think of the latest and greatest and most technologically advanced campaigns in the world. I think when people think about big data, they think about marketing technology. They think about lead nurture programs. Then you have events which in many cases have kind of lagged. Talk about where event marketing is today in the 2017 B2B world and where do we need to take it to make sure that it aligns with the way that we're managing sales and marketing today. Mark answered, "I think it has been a laggard, and I think it's quickly catching up. I know when I first got into this business one of the motivating factors was every financial officer I ever talked to was frustrated with their event spend. They didn't know what value it was bringing. Tons of money going down that channel, but they didn't really understand the benefit they were getting out of it. Early on event marketing was very logistics focused, tactical, processing names, registrants coming to an event, putting badges on people. It was kind of pretty basic meat and potatoes. As marketing analytics have evolved and people have gotten smarter about looking at data and taking data and turning it into information, the events industry and the discipline has certainly caught up. " Matt later asked, "How should marketers should think about this in a complex sales cycle, right? I mean if you're not doing transactional sales, if you assume that the white paper didn't generate the sale, what do you recommend for marketers that maybe ... It's mid-August, but a lot of people are already thinking about 2018, to start to think from a strategy and a planning standpoint of how to do we incorporate events and event marketing technology into their mix." Mark says, "The event marketing discipline or the portal that we call it, it really is ... It's not the head on the dog. It's the body on the dog, right? It's got to follow the marketing objectives, the campaigns, the purposes. These things are manifesting inside of the events activations, right? Whatever those corporate marketing initiatives are, bright people are sitting down and they're spending time and they're saying, "Okay. How does this manifest inside of my event activation campaigns," whatever those objectives might be. Then once the link is created from the strategy office in the house down into the activation fields, event marketing being an activation field, now we're getting into planning and activities that support meeting of those goals whatever those goals might be. " Listen to the full replay for more insights.